Just like Steve Jobs is an epitome of innovation, our updated Keyword Research Tool is aiming at the same level of excellence and innovation. That’s why it follows the overall slogan for Squirrly’s Steve version – think differently. For our keyword tool, thinking differently means providing the same quality while constantly seeking to be more customer-centric. We want to help you optimize your writing workflow while also ranking higher. Because the fewer time it takes you to research the keywords, the more time you can allocate to creating the finest content (which is another part Squirrly SEO helps you excel at with the improved 2018 Inspiration Box). That said, let me introduce the upgrades that help you both with writing and SEO. Right off the bat, you’ll notice a change in the visuals department. This is how the tool looked like with the 2018 version. The information was visible only when hovering over a specific item on the list – which some of the Squirrly SEO users did not notice. So we worked on the issue and came up with a more intuitive display of the research results. As you can see with the Steve version, Squirrly now has a more user-friendly interface and displays the results in a neat table. You won’t have to hover over each keyword in order to get the data you’re looking for. The Squirrly SEO 2018: Steve keyword research tool saves you some effort and tries to make everything as straightforward as possible. We gather the keyword data based on the same algorithm, but we introduced intervals for the search volume figures, to make it more relevant for values under 2000. SEMrush was our main provider for the search volume in the past, but they seem to have few keywords available (I mean.. they are a LOT, but still not enough for all our users. We’ve studied this). So for the ones that SEMrush doesn’t know about it we now have our own algorithm that shows the search volume. To optimize your experience even more, we added the Options column, where you can press the Use Keyword button for the item you select. Once you do this, the keyword will be used in the “Optimize for Keyword” box. Inside scoop: our next plugin update will let you create and manage your own space for keyword optimization across the entire website. But more on that towards the end of the year – until then, you can check what’s up with this version (called Squirrly Briefcase) on our public Trello board. The Squirrly 2018 keyword research tool was a hit with our users, but we soon realized not all of them had the same needs when it comes to finding keywords. This applies not only to the number of results retrieved but also to the amount of time different users are willing to spend within this stage of content creation. Complex: up to 50 results in 300 seconds tops (this option analyzes more pages and the retrieval time depends on the type of keyword you enter. For a longtail or less common search query, our algorithm will naturally need more time to analyze the results. Note: When you get the Squirrly Steve version, the keyword research will be set by default on the Normal mode. If you need fewer or more results, make sure you choose Fast or Complex. From all our tests, we could see that the Complex search really does the work of an in-house SEO when it comes to researching keywords. It’s true that not everyone wants to spend so much time with the researches, but the results are really impressive. You can uncover many opportunities which would otherwise remain hidden. Okay, most of them would’ve been a bit more accurate. Read on to see just how many we have available for you now. As proud as we were of the Squirrly SEO 2018 version, there still was something missing. 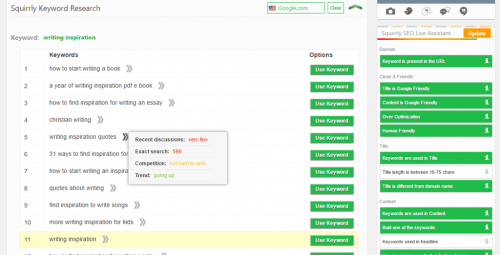 Namely, the Keyword Research Tool displayed 26 countries users could perform the research for. But since our user base is global, we kept getting asked about this or that country, so it didn’t take long until we added the 114 countries more. This makes for a total of 140 countries you can check. Right inside your WordPress editor. No additional tool needed. The thing with keyword research tools is that they grant you the opportunity to fine-tune your marketing skills. But fine-tuning does not imply a better understanding of analytics only. It also requires strategic, long-term thinking. Being able to interpret past results and make informed decisions for the future. 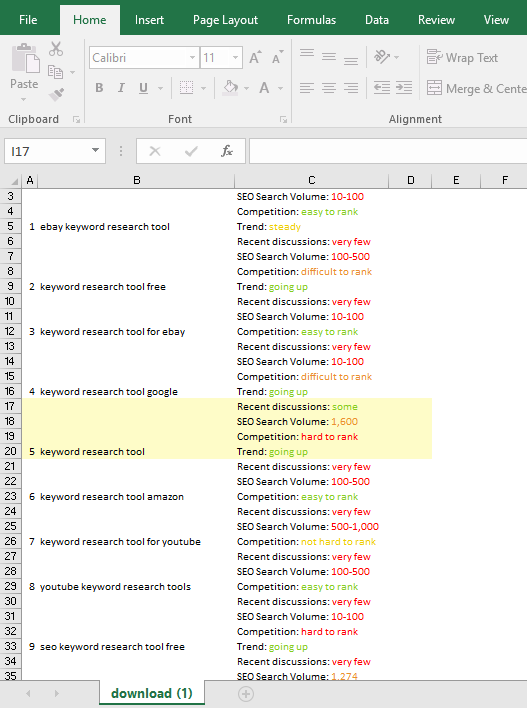 Click on it and Squirrly will automatically generate a downloadable Excel document featuring all the keywords generated across a research session. Now, all the information generated by the Squirrly Keyword Research Tool will be stored inside a separate folder that you can visit anytime you need. You can start by building a keyword research database. You can even compare how these insights changed over a period of time and then assess future changes in trends. The ultimate goal we have in mind with the Squirrly SEO 2018: Steve version is helping business owners and marketers turn website pages from ‘never found’ to ‘always found’ on Google SERPs. 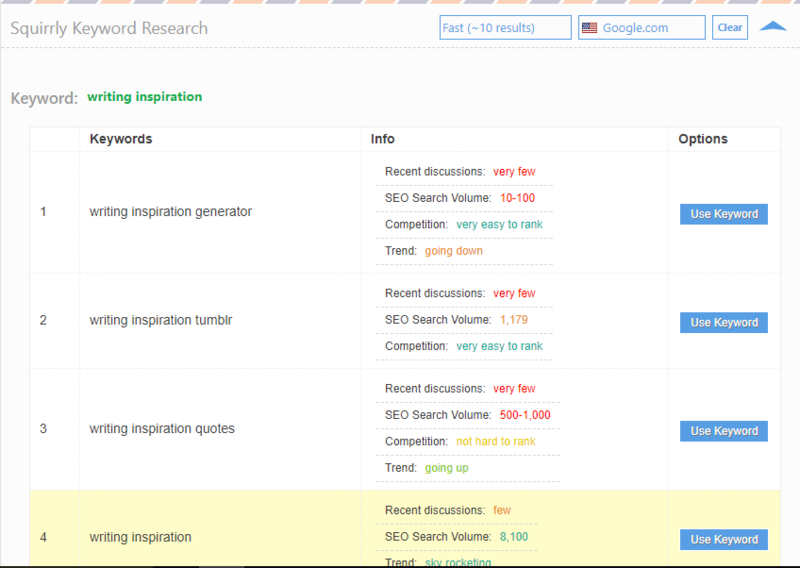 In this respect, our updated Keyword Research Tool is certainly a key feature in our plan. Remember that the competition data is incredibly important because it tells you what chances each of your sites have of getting ranked on any keyword. improved possibilities for local and longtail keywords research. Once you’ve picked a keyword and created the content optimized for it, you can proceed to use the other Squirrly SEO Plugin settings. Mind you, we’ve got plenty of other feature updates for this version, so I’d say keep an eye on your inbox. Last but not least, 10th of October. Save this date (by getting your free VIP access to the Launch Event) because this is when we’ll go live for the launch event and show you exactly how all these updates work together.